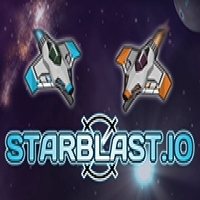 Starblast is an incredibly addictive space themed shooter game, you take control of a small, basic ship to begin with and harvest gems to increase your stats. Once you’ve maxed out the stats available to a specific ship you are given the option to evolve your model into a different type of spaceship that has a different type of weapon set/overall stats. Game directions: This game can be played either passively, avoiding other players and farming gem rocks until you’re strong enough to defend against yourself or you can play aggressively and try to attack people as they’re roaming around or farming which is definitely more fun in more opinion. In my personal encounters with the game it seems that the larger ships usually have teammates who join them either out of fear of being destroyed or just people they know, because of this it is highly recommended you try to make a friend in game or bring one in with you! Controls This game gives 2 options for every action, you can either control your ship via arrow keys and fire using space bar or you can use your mouse. When using your mouse you navigate by holding in right click and dragging around whilst shooting with left click, I personally prefer this option as you have more definite control over your movements.